A new framework provides you with a 3D view of even the most complex deal. That means you can maximize your chances of sales success. How to deal with accelerating procurement trends such as; spend analysis, demand management and supplier concentration. To address these and other sales challenges, we have developed a powerful framework, called 3D Selling™. It is designed to boost your success and overcome the uncertainty and indeed frustration in selling to the more demanding and sophisticated buyer. We have analysed 1000’s of buying decisions, grouping them in terms of complexity and identifying common patterns and consistent decision making variables. Although the research runs to 1000’s of pages, its overall results can be presented in an easy to communicate 3D framework. It says that any buying decision can be analysed along 3 dimensions, as shown in the diagram below. The diagram above is not just a framework, but a paradigm shift. It is a new way of looking at and understanding the sale in all its complexity. 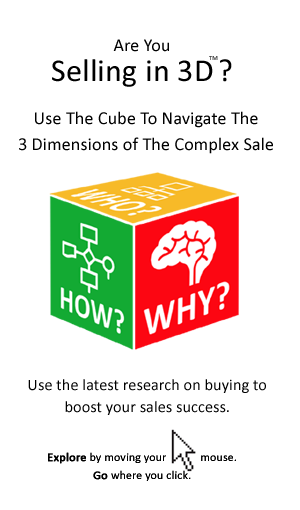 If there are 3 dimensions to buying, that means there are 3 dimensions to selling too. That includes prequalification, forecasting and closing. In an era of budget cuts and stalled deals understanding the 3 dimensions of the buying decision is at the core of every sales team’s performance. (a) What Is Buying Process? It includes the steps, information requirements, paperwork, review / sign-off points, etc. (b) Why Is Buying Process Important? Buyers are adopting an increasingly scientific and structured approaching to making their decisions. In most organisations they don’t have a choice, following the prescribed buying process is essential to getting the purchase sanctioned. (c) How Has Buying Process Changed? The level of autonomy of managers in respect of buying decisions has been greatly curtailed. As an example the Manager of a multi-national subsidiary is unlikely to be able to approve purchases of more than 50,000 $ OR euro without international sanction. In addition, getting senior management sign-off requires much more than just rubberstamping purchase requests. (d) What Does Buying Process Mean For You? You must know the buyer’s process and align your sales process to it. 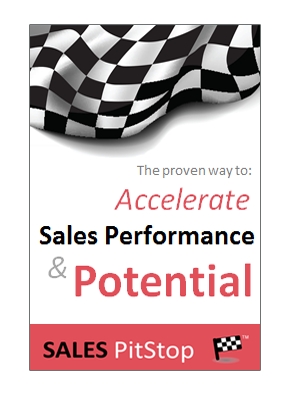 You cannot accelerate the sale unless you accelerate the purchase decision that underpins it. You cannot close unless the buying process is complete and sign-off is possible. You must slow down before pitching and presenting, or issuing a proposal – you may not be ready yet. Buyers are calling on suppliers later in the buying process. Sales people must get involved earlier before requirements, or a budget has been allocated? (a) What Is Buying Logic? How do buyer’s decide? A more logical and analytical approach to buying decisions is a clear trend in modern buying. These headings are essential to an understanding of the buyer’s needs and requirements. (b) Why is Buying Logic important? Buyers are exercising greater care in making buying decisions. With many projects competing for scarce resources, managers must justify their purchases based on the results that will be achieved. Major purchases are not made based on a whim, nor are they made based on the relationship with, or influence of the salesperson. In short the best business case wins. (c) How Has Buying Logic Changed? This is the age of the rational – economic buyer, where the cost-benefit analysis and the business case is king. Some form of business case may even be required for purchases as low as 20,000 dollars. The issues of compliance and risk management are now more important than ever. There are of course other factors involved in the buying decision, such as; politics, emotions and impulse – after all decisions are made by humans not computers! Yet, it is the primary goal of best practice procurement to marginalize, if not completely eliminate these factors. (d) What Does Buying Logic Mean For You? Replace adjective-laden marketing literature, with case studies and other more useful, or credible information. Help the buyer to build a compelling business case, using the buyer’s key metrics to present a ROI as part of your proposal. Understand all of the alternatives available to the buyer (including do it in house, delay a decision, etc.). The real competition for your solution is not another supplier, but another project. Bring buyer risk out into the open (project risk, financial risk, supplier risk, etc.). (a) What is the Buying Team? The Buying Team consists all those involved in making and shaping the buying decision, from the senior executives who must sign it off at board level to the end users and others who are consulted as part of the information gathering and decision making process. (b) Why is the Buying Team important? In most cases those who made buying decisions in the past, can no longer sign the purchase order. The locus of buying power and influence has shifted. That means a lot of salespeople are selling the wrong thing to the wrong people. Today’s important purchases involve managers from many departments in a functional buying team. (c) How Has the Buying Team Changed? Most buying decisions are being made higher and wider, involving more politics and consultation. All in all it makes for slower and less predictable decisions. Today’s buying is increasingly multi-functional, maybe even multi-national and multi-organizational (e.g. consortia) buying teams. The fact that decisions are being made at more senior levels means that the basis for decision has shifted. A different message and approach is required to engage with the grey-haired C Level buyer. Added to this the face of buying has changed. The terms that sellers use to describe today’s buyers include: hard-nosed, sophisticated, demanding, price-conscious, risk adverse and busy. (d) What does the Buying Team mean for you? Don’t underestimate the buyer – he/she may know more than you. One contact in the organisation is not enough. More people involved in the buying decision necessitate a team based approach to selling. Contacts must be nurtured over time to sales readiness. Getting access to senior level management is key. It requires being an expert, rather than a sales person. Boosting sales performance and advancing key opportunities requires 3D Selling™. Are you selling in 3D?